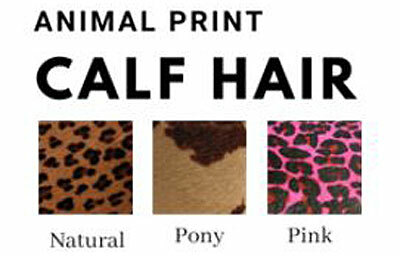 The Brie calf hair in leopard or pony print dog collar is a classic. This beautiful leather collar with a single row of hand-set Swarovski crystals has such an exquisite shine. The single row of same stone color crystals are attached with a back rivet to secure each bezel set crystal. It is such a nice match with the Brie leash and harness. 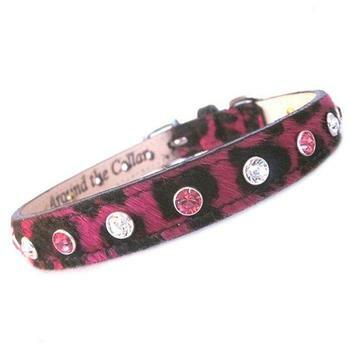 Each collar has a nickel O-ring on the loop to attach ID tags. Size 8" -12" will have the D-ring to attach the leash near the buckle. Size 14" & up will have the D-ring to attach the leash in the center of the collar. Available In: 8" x 1/2" , 10" x 1/2 ", 12" x 5/8" , 14" x 3/4" , 16" x 3/4" , 18" x 1" , 20" x 1" , 22" x 1" , 24" x 1"